Increased friction and the feeling of a crisp gear change utterly ruined by a chainset covered in oil, mud, and grease? 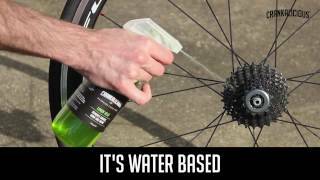 Struggling to remove bonded contamination on the frame using normal bike cleaning spray? Reach for the Crankalicious Limon Velo degreaser Spray. It’s a water based degreaser designed to penetrate and remove all that grime. 1. Spray Limon Velo liberally over your cassette and derailleurs [or other parts of the bike], and allow to dwell for 2-3 minutes. 2. Work the product in with a brush to aid cleaning. 3. Rinse thoroughly and completely with a low pressure water spray. 4. Repeat the process if drivetrain [or frame] is particularly dirty.